Little wonder that the one time I come home in over fifty days, you are busy in Brigobaen with the pilgrimage. The kitchen is in shambles, so I can imagine how well that went – I look forward to hearing about it later! But for now, I feel inclined to leave you this sure-to-be-lengthy note, as many things have transpired in my adventures to the north. It was early in the morning of the 110th day that I joined a large party of hunters at the Marali portal. They were gathering to investigate a Black Hand fort that had been reported near the Marali Lake, and naturally I decided to accompany them. It was quite the merry band, complete with four or five wizards – not the least of which was the legendary Lym, who I had not seen since the '30s. His spells, alongside all the others present, made for a most electrifying day. Bronte was there too, and informed me that he had just ran into Estess Vorund at the portal, moments prior to my arrival. Vorund had warned him to take the coast for safety reasons. We of course chose not to heed his words, and proceeded to advance straight for the lake. But evidently, none of us knew exactly how to get there, and before long we were all lost in the woods. 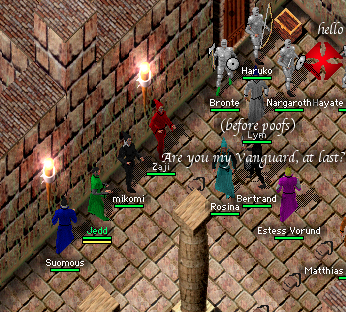 I eventually caught up with Mikomi and Indy, and we ran into the others just as we stumbled across the fort, and all of the brigands and gapers waiting within. No sooner had we regrouped, than the first magma golem came lumbering out. That, plus the hell mages that we would soon run into, was enough to convince me that we were dealing with the handiwork of Fyod and/or Denreth, possibly Jalux too. At some point during the chaos, the brigands' leader – a wizard – emerged to face us. I had overheard him shouting something along the lines of, "Kill them, but save the mages' heads" – I am still unsure what to make of that, but I leave you to your own conclusions. After a long day of fighting, we eventually defeated the mage and all of his fell creatures. The fort itself was rather small and cramped – and seemed to be almost bursting from all the heat. Inside, we found a note that read, "Deliver the mages intact", and which was countersigned "haven". 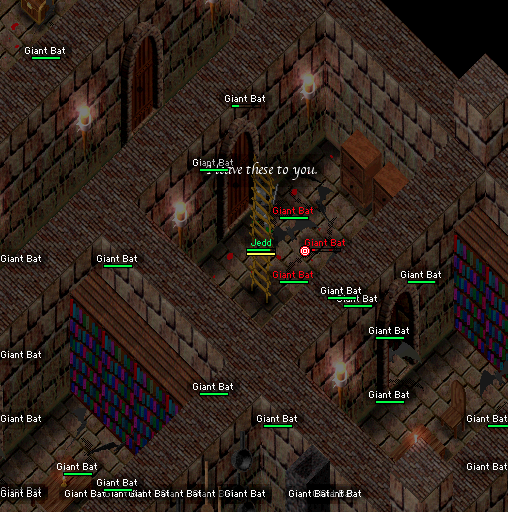 There was also a chest, containing four pure black crystals, forty bone mage staves, and four shattered crystal skulls. That was all we could uncover, so we returned to Marali. There I was with Bronte and Rosina, discussing the mysteries surrounding Estess Vorund, when who should appear but the man himself. We all fell silent, and as he entered, he asked if there were any of his vanguard present. That elicited a "no", of course, but the good folks of the C.A. did inform him of our battle at the lake. I made sure that he had received Istra's tome as well, and made a miserable attempt to explain the who's, how's, and where's of the whole affair. I'm afraid I led him to believe that I represent the Mirith Vanguard, as there wasn't really much choice. And when I had dug myself into a seemingly insurmountable pit, I simply feigned ignorance and that seemed to do the trick. He has never heard of Miss Istra, on that note, and even just the mention of the family name was enough to draw his ire. Anyhow, after enough of my stumbling around, Bronte finally ended up confronting Vorund directly, asking him where the real commander was. Vorund merely left to go call Mother Terwynn Rees, who promptly arrived and began casting curative spells on all present. This is where things started to get even more concerning. She initially referred to the man as "Estess", before correcting it to "Commander Vorund". She told Bronte not to ask too many questions, and then said something along the lines of, "Talk to your friends away from walls." She would repeat that phrase one more time before leaving us to our confusion. I promised Bronte that I would try and ask Istra Falvo to shed some light on the subject – I will be writing him shortly. The next curiosity would transpire on the 132nd day, when I met Estess Vorund again in the halls of the fortress. But this time, there were bats – bats everywhere. Vorund shrugged it off as if it were some minor nuisance and went on his merry way, but I followed the trail all the way to its source: the Commander's office. Inside, the forge was mysteriously glowing, in a way that only magic could make possible. It was still hot, and smelled faintly of etherite and coal. I spotted an book at the end of the table, and it didn't take much flipping through the pages to realize what it was: a tome of Black Magic, containing instructions on how to raise creatures of shadow. The page that had been left open was a section exploring the creation of bats. Fearing the worst, I snatched the tome, hastened upstairs, lied to the guards, and made my way back here in search of Istra. I arrived on the morning of the 133rd, just in time to catch her in the midst of her soup delivery to the soldiers upstairs (on that note, she reports that Mr. Lofty Curve is happy, but still resting. We must continue that particular topic of discussion in person.) I showed her the tome, and she reassured me that it was merely "Black magic for kiddies", and that it couldn't conjure up anything beyond those bats I had faced the day before. By way of contrast, she seems very eager for Vorund to test out her own tome – the one that I had delivered all those days ago. I am unsure whether to be alarmed or pleased at this. What trick does she have up her sleeves? Hopefully, it is one that will work out to our common advantage. I would have inquired about this further, but she then made her leave, swiftly as ever. As she departed, she let me know that she has been tracking some "woman-child", and that she believes this person may be in Andris. Who this person is, or why Miss Falvo is tracking her, remains outside of my comprehension. So there you have it. Now, I expect that by the time you read this, I will in all probability be back in Marali. Please respond at your earliest convenience, as I am sure you have noticed some detail that I did not, which might prove instrumental in dispelling our confusion. But until then, my good sir, take care!